Everyone seems to be searching for style -- not fashion but photographic. It's part of the evolution of the photographer. You start off shooting everything and along the way you discover your true voice. You develop your own unique style. 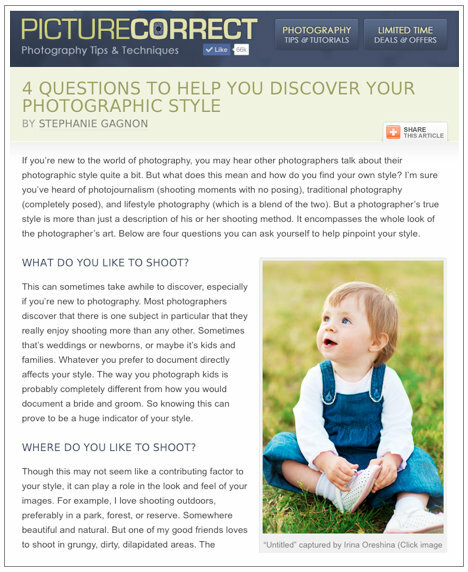 If you are still on the pathway to finding your style, PictureCorrect offers four questions to help you narrow it down. If you want to go deeper, check out our February 2013 webinar on Developing Photo Style. Project 365 idea: Take a photo that imitates the style of a photographer you admire.